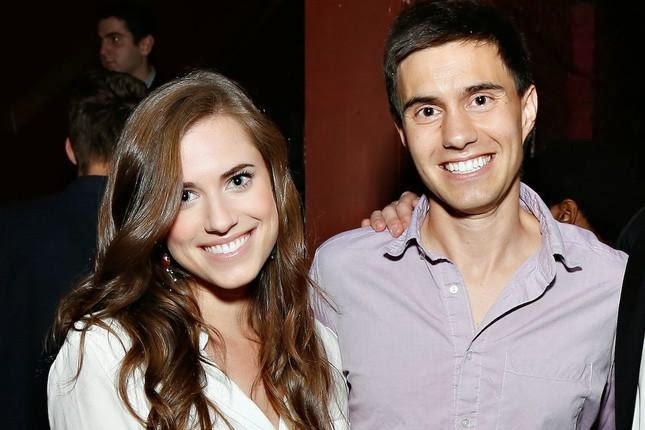 Girls star Allison Williams, who plays Marnie, the pretty girl nobody likes, is engaged to Ricky Van Veen. No, Ricky Van Veen is not a character in a Judy Blume book, he's an actual human man; in fact he's a very wealthy human man. Van Veen is one of the co-founders of CollegeHumor, the website that makes prank videos. (I'm told there are other, non-prank videos, but I'll believe it when I see it.) So that's basically a lot of money marrying a lot of money. Nothin' wrong with that! Think of how nice their apartment will be. Or house! Could be a house. Maybe once they're married, Ricky Van Veen and Allison Williams will take to the country, or the suburbs. Maybe they'll buy a house in Rye or Ossining or Cos Cob and live a very sort of traditional life up there. More likely, though, is that they'll move to Brooklyn Heights and do that whole thing. Again, nothing wrong with that. And think of the wedding! Lena Dunham as a bridesmaid, the other CollegeHumor pranksmen as groomsmen, Brian Williams giving a misty-eyed toast. Van Veen is friends with John Mayer, so maybe he will play a song at the reception or as Williams walks down the aisle. I mean, this is shaping up to be the wedding of the season. Though, at 25, Williams is young to be getting married, so hopefully this is a long engagement. But not long enough for any pranks! No sir, they shouldn't give any of those CollegeHumor pranksters too much opportunity to pull any sick pranks. Though, I'm sure there are plenty of pranks already in the works! Welcome to Prank City, population you two guys, Ricky and Allison. Hope you like pranks, Ms. Williams. Because you are marrying into prank royalty.